Gluten-free raspberry muffins made with ground almonds and shredded coconut which are also lactose-free and, if you leave out the honey, even sugar-free. I admit that I rarely take on cook jobs where the clients can’t or won’t eat a huge number of different types of food as I’m not sure I’ll be able to be creative enough. But I am forever curious when it comes to food, and I want to constantly try new things – new recipes, new methods, new ingredients. My curiosity was definitely awoken when I saw recipes for gluten, lactose and sugar-free cakes in a magazine and I had to come up with a recipe myself. Look, I’m not trying to kid either myself or anyone else that these muffins are comparable to a cake full of sugar and butter, but they are tasty. Why wouldn’t they be – they are full of tasty ingredients. They are also full of healthy ingredients with a natural sweetness - ground almonds, coconut and raspberries. I’ve flavoured these gluten-free raspberry muffins with vanilla extract and you can also add 1-2 teaspoons of honey if you wish. On the subject of honey, raw unpasteurized (untreated) honey is rich in beneficial enzymes, vitamins and antioxidants. Runny honey is made by heating up raw honey to make it more liquid so that it can be cleaned up and put into jars or plastic bottles. The heat turns honey’s natural sugar into another fast-releasing sugar – pretty much like ordinary sugar – and removes all the health benefits of honey. 1. Pre-heat the oven to 200C, fan 180C, 400F, gas mark 6. Line the holes of a muffin tin with 9 medium-sized muffin cases. In a bowl, mix together the ground almonds, shredded coconut and baking powder. 2. Break the eggs into another bowl and add the vanilla extract and honey, if using. Whisk together lightly with a fork. 3. Add the egg mixture to the dry ingredients and mix together. Carefully fold in the raspberries. Divide the mixture between the muffin cases and place the muffin tray in the oven. Bake the muffins for 18-20 minutes, until they have a nice brown colour. 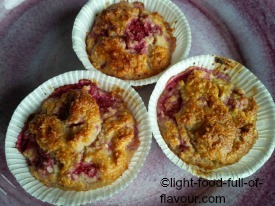 Allow the gluten-free raspberry muffins to cool in the tin.